Liskeard is an ancient hill-top town located on the A38 some 20 miles (32 km) west of Plymouth. A Norman castle was built here after the Conquest but nothing remains of it today. During the tin mining era Liskeard prospered to become a stannary town responsible for collecting the tin coinage, which was a tax on refined tin payable to the Duchy of Cornwall. Local mining activities continued to benefit the town and in 1828 a canal was dug permitting ore and stone to be conveyed to the coast at Looe. This canal was eventually replaced by the railway and the line remains in use as the Looe Valley Line which runs along wooded riverbanks to the sea. 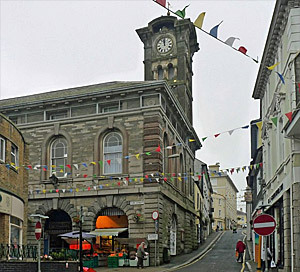 Liskeard today is a busy market town with several interesting buildings. There is a Victorian Guildhall with an impressive clock tower and many of the shops have retained their Victorian frontages. Stuart House, where Charles I is said to have stayed for 6 days during the Civil War, is now used as a community building. Markets are still held each Monday and Thursday. Liskeard is located near the southern border of Bodmin Moor, where there are several sights worth visiting such as the beautiful Golitha Falls and the mysterious rock formations of the Cheesewring and the Hurlers. 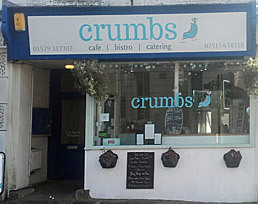 Welcome to Crumbs! It's our pleasure to serve you some of your favourite eats, treats and sweets, morning and afternoon, come rain or shine. Our aim is that once you've ate, there's only Crumbs left on your plate!